This is a recipe I dreamed up and my mother and friend, Jyl, helped me name. It’s light, fruity, and perfect for a hot summer’s day since it is served cold. This uncomplicated recipe begins with a mix, too! Make this day 2-3 days ahead of time and have it waiting in the fridge when company arrives. Scoot on down to the next picture if you want to dive right into the recipe. If you’ve a mind to visit a spell, stick around on this spot for a few :). A very popular saying right now is “In a world full of pigeons, be a flamingo.” I’ve seen it all over Pinterest, happened upon random memes with it on Facebook, and even contemplated cross stitching it. But the truth of the matter is, this is easier said than done. It is easier and often more comfortable, when surrounded by pigeons, to just be a pigeon, even if you have to wear a thick sweater to hide the pink feathers. I doubt most of us even realize we are wearing the sweater because putting it on each day has become such an ingrained part of who we are. But when you were created to be unique and choose to conform to what others are doing instead, not only are you missing out on all the wonders your destiny had in store for you, but the world is missing out on the contribution you were meant to give. Now funny enough, most people reading this may think I’m going in a completely different direction with this post. I’m actually talking about following Jesus. There are an awful lot of pigeons out there but if God has given you the wisdom to be a flamingo – well, you know what you gotta do. Narrow is the way, and few will find it. Now let’s make a cake. I love cakes that start with a cake mix. If you’re here looking for a cake to make from scratch, check out my Easy Peasy Birthday cake recipe by clicking here. If you’re like me and love the magic of a mix, hang around here because Flamingo Cake is just amazing. 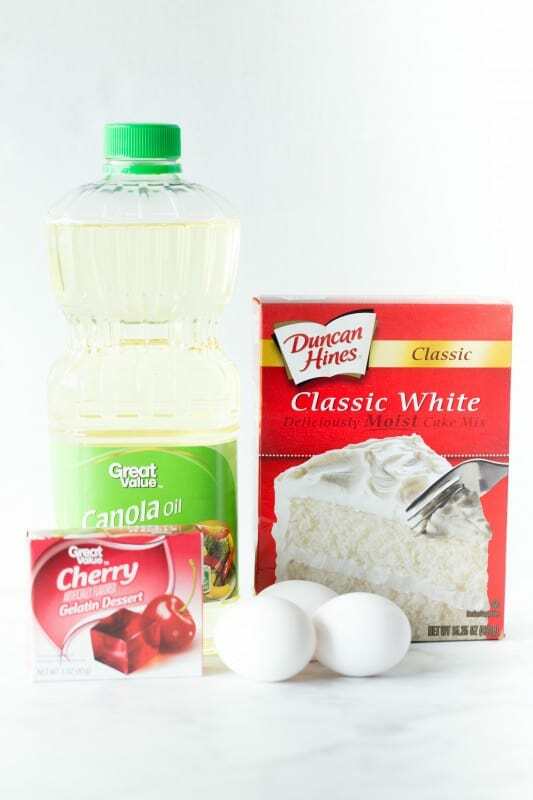 To make the cake, you’ll need: cherry gelatin mix, vegetable oil, buttermilk* (not pictured, it was shy), and 3 eggs. As always, the amounts and such are at the bottom of this post in the little handy dandy printable recipe card. 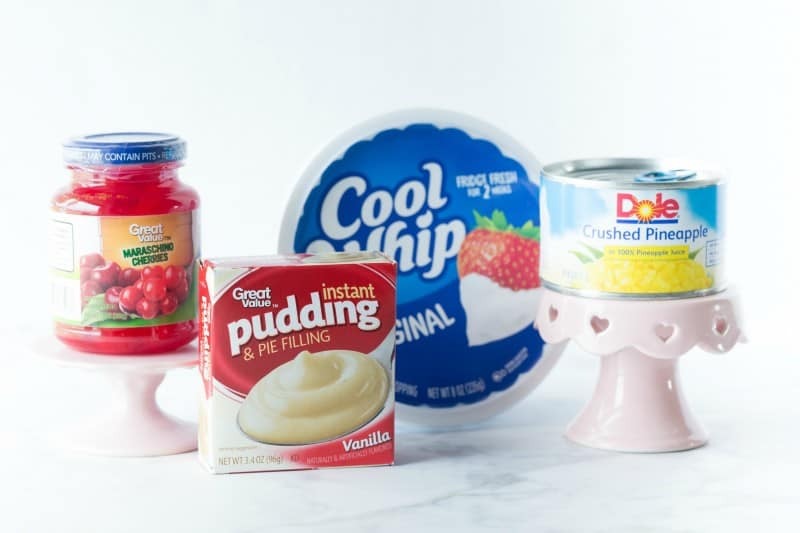 For the icing you’ll need: 8 ounces crushed pineapple, 3.4 ounce package of instant vanilla pudding, 16 ounces whipped topping (thawed), and an 8 ounce jar of maraschino cherries along with their juice. Of course you can make homemade whipped cream if that’s what cranks your tractor but I can’t help but love me some cool whip so there is room for both in my kitchen. In medium bowl, place crushed pineapple, juice and all. Sprinkle pudding mix over and stir with spoon until well combined. Stir in whipped topping until fully incorporated. Chop cherries in half and add those in along with enough cherry juice to tint the mixture light pink. Stir until well combined, adding more cherry juice for color if need be. Frost cooled cake. Cover cake and place in the refrigerator for 2-3 days before serving. Enjoy! In large mixing bowl place cake mix, gelatin, oil, buttermilk, and eggs. Beat with electric mixer until smooth and well combined, about two minutes. Pour into greased 9x13 pan. Bake at 350 for 30-35 minutes, or until the center springs back when pressed lightly. Allow to cool completely. In medium bowl, place crushed pineapple, juice and all. Sprinkle pudding mix over and stir with spoon until well combined. Stir in whipped topping until fully incorporated. Chop cherries in half and add those in along with enough cherry juice to tint the mixture light pink. Stir until well combined, adding more cherry juice for color if need be. *In place of buttermilk you can use one cup whole milk and one tablespoon of lemon juice. ~Thomas S. Monson. Submitted by Jackie. Add your favorite quotes to our collection by clicking here. Thank you, Brenda! Have a great afternoon! Wow…sounds very good, Christy! Thanks!! Thank you, Bobbie! Have a great day! Sounds delish! Not sure I can wait 2 to 3 days to eat though. I totally understand! In that case just get it good and cold and dive in! I wonder if this could be made ahead and frozen to have on hand? This cake sounds great…but a question: do you have to wait 2-3 days to eat it? Can it be eaten sooner or is there a reason it sits in the fridge so long? Does the texture or taste change? Inquiring minds in Jacksonville,FL want to know!! Thank you!! I know my family will just love this cake!! I want to try this very soon! What a perfect summer treat!! I love the name and the story. Thanks Christy, as always, you are a blessing! Sounds scrumptious! The last maraschino cherries I bought came in a “ziploc” style pouch. 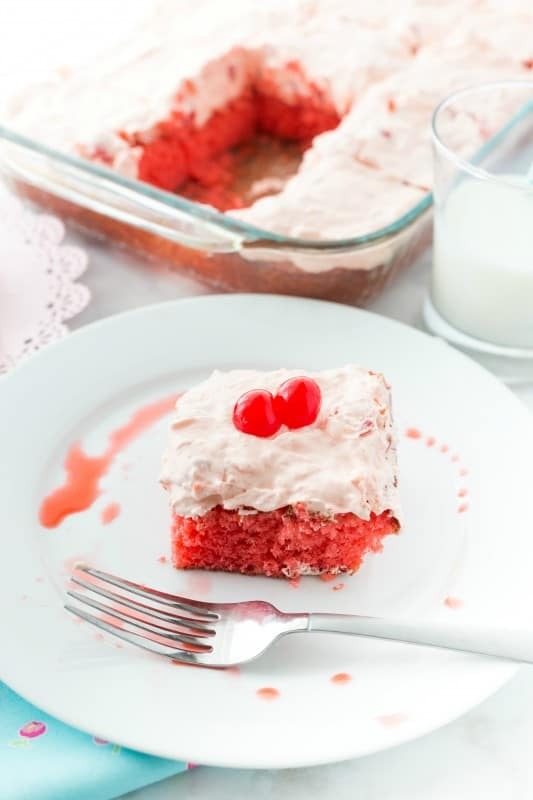 Your recipe brings to mind Cherry Yum Yum, the icebox dessert. Oh my goodness, I’ve never seen cherries like that! How neat! I’ll have to look up that dessert, too! sounds great! do you think using sugar free gelatin,pudding mix,and whipped topping would still taste good? trying to stay as close to diabetic diet as possible! Thanks for encouraging us as always!! God bless! Absolutely, that would be what I would do if I were making it for myself as well. Personally, I can’t taste a difference. Hey, anywhere you can cut calories helps! I am diabetic also. check as to what is used in the gelatin for sweetener, some of which do not bake well and actually change chemically at high heat. Splenda, a.k.a. 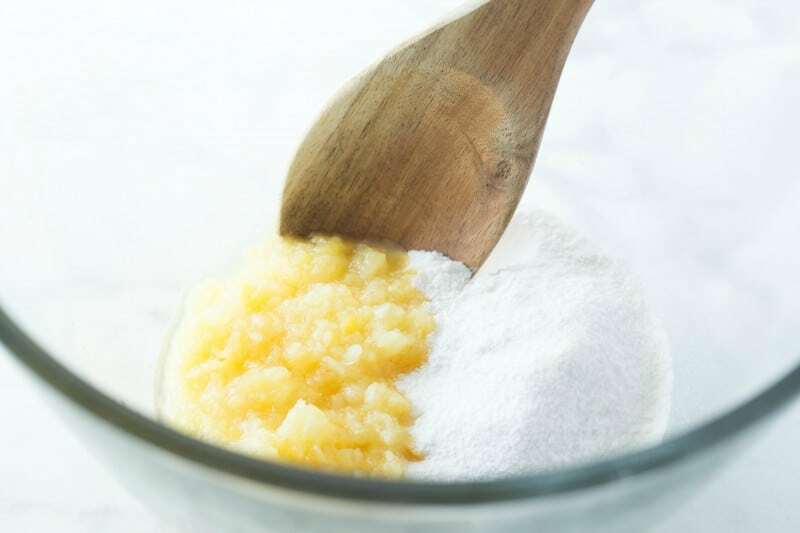 a sucralose-based artificial sweetener, is made for baking temps. If you are not sure is the gelatin is sucralose based, it is safer to use regular gelatin and just eat smaller pieces. I’ve baked cakes like this with sugar free Jello brand gelatin and had great success. This sounds yummly! I will be making it very soon. Thank you for sharing it with us all. Thank you Carolett! Have a great evening! My mouth is watering just thinking about this cake. Yum!!! Thank you so much Lorraine! 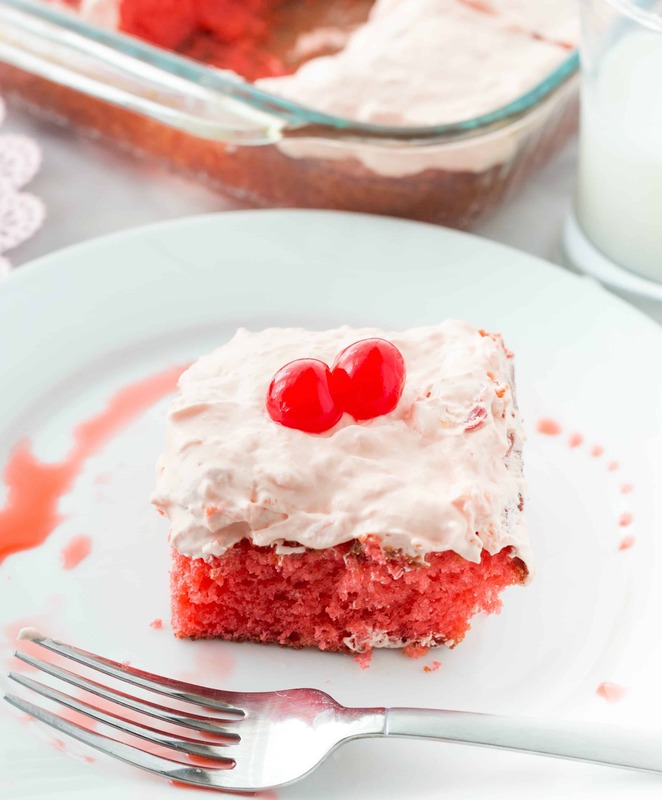 Do I have to use maraschino cherries in the icing? I have never liked them. Could I just tint the icing pink with food coloring? 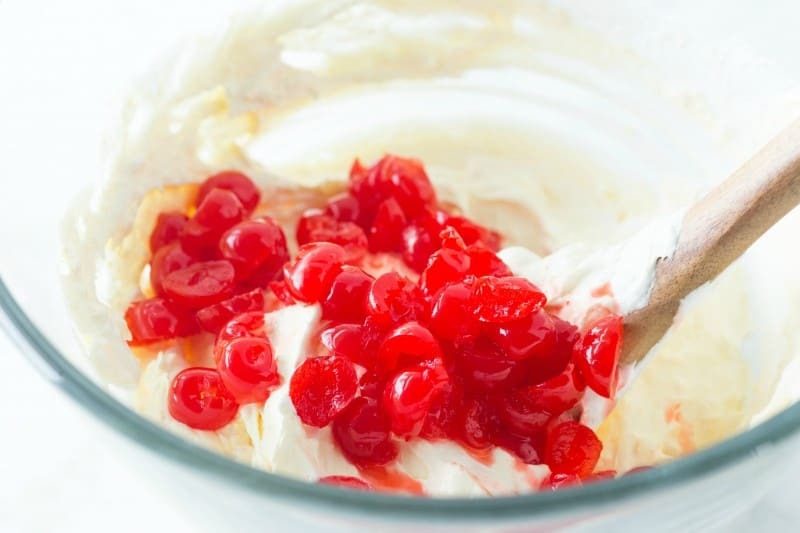 I’m making this for a family reunion this weekend–and I’m going to use the cherries. I’ll just pick them out of the icing on my piece! I hope everyone loves it and you all have a wonderful time catching up!! My mouth is watering!!! What a great treat on these hot summer days! You have inspired me to play around with cake mix and jello – how many fabulous combinations can I come up with?? Thank you for always inspiring me with your recipes and your words of wisdom…God’s blessings upon you and yours. me too, I am thinking orange or peach or…. so many flavors so little time. This cake looks delicious!! I will have to wait until my red velvet cake is all gone before I try this one. I love maraschino cherries!! I bet that making this with a chocolate cake mix would be great too! Thanks for another great recipe! I am pinning this to my board. I don’t think I could wait the 2-3 days to try it. If we started on it the first day, it would never last 3! I’ll just have to make one to test our willpower! 🙂 It is a test of willpower!!! Thank you!! Hope you get the chance to try it soon!! Oh my gosh, when I saw that picture I thought you had redone that 1970’s strawberry cake that I can’t find the recipe for. It was so good and used frozen strawberries in the mix and the icing. This recipe looks so good too, I’ll make this for the next gathering. 🙂 No, but I hope you will give this one a try!!! 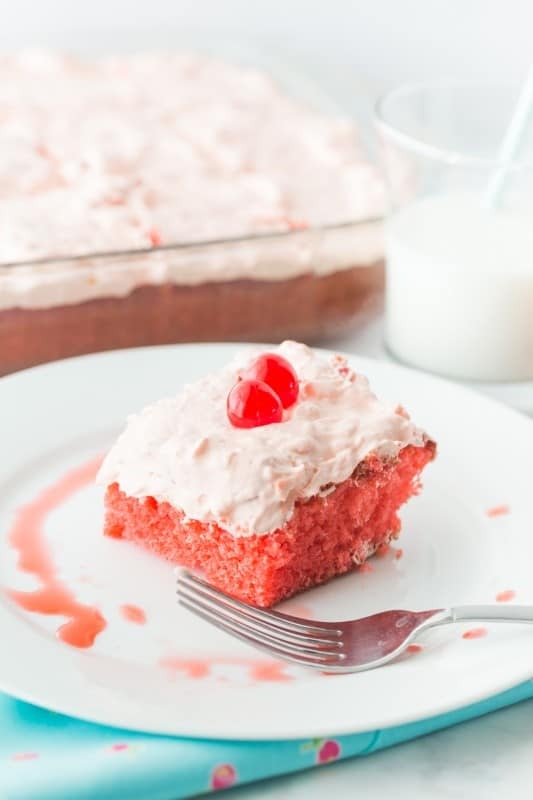 You can find the 1970s strawberry cake recipe on Texansunited.com or on Pinterest. Out of curiosity, I just went to look for the strawberry recipe mentioned above and I can’t find it on either site. Thanks for the recipe. God Bless. Christy, picked up all the ingredients for this cake today, can hardly wait!! I noted the box of Jello brand gelatin is only 3 oz. now… seems all brands are shrinking pkg. contents (but their prices don’t go down) – it’s no longer 3.5 oz. Will this make a difference in the amount of liquid I will be putting in the cake? Do I have to decrease the buttermilk by a couple tablespoons? It shouldn’t make any difference at all!! I can’t wait to hear what you think!! Will two small boxes of jello work just as well ?? This cake was well received at ladies ministry meeting after 24hr in the refrigerator. The icing on the cake reminded the ladies of pink fluff. I brought home the leftovers. Testing my willpower for 3 days is going to be hard. I am glad to hear it was a hit Valla!!! So happy to hear that we don’t have to wait 2-3 days to enjoy this cake! I baked it today and my husband commented that he couldn’t remember any other dessert I’ve made smelling so good while it’s baking! My family is super excited to try it! Thank you Christy! I would like to use real whipped cream, rather than the prepared whipped topping. Do you think it will “hold up” well for 2 or 3 days? If you add a little meringue powder (tablespoon or so) it should. That will help stabilize it. To be on the safe side, you could just make the cake, refrigerate it, and ice it just before serving. Oh my , my , i got to make this , but i’m going to be afraid to cut it , it’s just soooo pretty, lol, ty sweetie , love all your recipes and all the hard work u put into this blog everyday , ty, and God bless u.
I made this and it is delicious! But, the cake portion, especially in the middle, was smaller than the topping. Is it supposed to be that way? I want to make the cake from scratch. What are the equivalent ingredients to replace the duncan hines cake mix? Just use your favorite 9X13 cake recipe of choice. I am so glad you liked it Tamy!!! It is one of my favorites too!! I made this and the flavors were really good but the cake itself was dry. I only baked it for 30 minutes and was using a non-stick metal 9×13 pan so I didn’t grease it. Any suggestions for next time? Can I make these in rounds instead of a square pan an make it into a 4 layer cake? I don’t see any reason why it wouldn’t work. Made this one for Christmas dinner. It turned out fab! Thanks for this recipe, Christy! I am so glad you liked it Lisa!!!! I made this two weeks ago and while to die for a delicious blend of flavors, my cake was also dry and then it dawned on me, I forgot to add the oil! LOL! Knowing now that the cake was not stale and dry only by my error, it was a huge, but laughable hit. That was not the only instruction I got wrong, I read to let it sit in the fridge for two to three hours, not DAYS! My husband and I split the difference and cut it in 2.5. the cake nearly lasted 3 days between the two of us. As I made an error the first time, I’m making it again this afternoon, first thing on the counter was the oil. We have decided that we are perfectly fine with the 2.5 hours though. 😉 Thanks for sharing, we love it! LOL, Love the way y’all think! So glad you figured out what made it dry and hope you enjoy it a little better this go round!! !